Hazelnuts ripen during September. The actual time of ripening varies from year to year and depends on late-summer warmth. 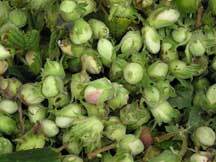 Expect the first hazelnuts to fall around early- to mid-September. A word of warning though! The first nuts to fall are often empty, so it is worthwhile waiting a week or so before making your collection. Where they are accessible, it is better to collect directly from the tree and leave the ones on the ground for the mice. The ideal time to collect is when the nut is easy to remove from the husk. This indicates that they are just about ready to fall. Carefully pull the clusters of nuts from the branches and keep in buckets or breathable bags. Perhaps the simplest way to extract hazelnuts is to pick them individually out of their husks. This can be time-consuming if you have a large number, but allows a very simple test to be performed. This test separates those hazelnuts that will grow from those that may not. The nuts (without their husks) are thrown into a bucket of water. Those that sink will more than likely grow, those that float won’t (or will produce a much smaller seedling). Simply discard the ‘floaters’, somewhere where the mice can clean up, and keep the ‘sinkers’. Mix the ‘sinkers’ with an equal amount of horticultural sand (one handful of sand to one handful of seeds). Find a pot large enough for this mixture and a bit more. Place a few stones in the bottom of the pot for drainage and cover these with sand. Add the seed/sand mixture and cover with a few centimetres of sand. Label the pot and place somewhere shady. Hazelnuts are a great food for mice. Wherever you put them, mice will find them! You will need to cover your pots with some wire mesh with a small enough mesh size that mice can’t get through. Leave the pots for the winter. When the seeds show signs of germination (check them from the end of February) it is time to sow them. In pots, simply place two seeds about 2-3cm deep, firm and water. Keep the pots moist. In seedbeds, we can broadcast the seed. Aim for about 400 ‘sinkers’ in each square metre – you should get 200 plants. The seeds must be pressed into the soil either by rolling or by using a large flat board. Cover the bed with 2cm of horticultural grit. Don’t forget those mice! 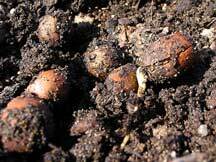 They will still discover your hazelnuts and, before long, you’ll be left with nothing but a seedbed full of holes! 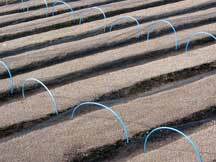 Cover your beds with netting and your pots with wire mesh. When the plants are about 15cm tall you can remove the protection. 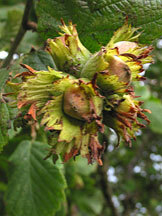 Hazelnuts are also a favourite food of jays and pheasants. Maintain protection from our wildlife during the growing season. Hazel doesn’t readily suffer from pests or diseases, so it should only be necessary to keep your pots or beds weed-free. Feed regularly and water during dry spells. Hazel can reach 40cm in one year. However, you do not need to transplant them for a second year provided they have enough space. If they do not have 10cm of space around them, they should be transplanted. Re-pot your pots where necessary and keep well-fed during the second year. Plant your hazel tree into its new home when it is two-years-old. Prepare the site well by clearing away any weeds or grass and make a hole big enough to accommodate the root ball. Plant carefully in the hole, to the same depth as it was in the pot or seedbed, and firm back the soil. If you want to establish a hazel coppice area, let the plants grow for three or four years then cut them back to the ground. This will encourage the growth of strong, straight stems typical of coppiced hazel.